The Bike & Chowder Club has two groups of riders. The A Group meets Sunday, Tuesday, Thursday and Saturday (16 - 20 MPH pace). The B Group meets Tuesday, Thursday and Saturday. The B Group rides at a stay together pace (12 - 15 MPH). Checkout the "B’s"
​ FB Page. Depending on who is riding, an A-/B+ Group sometimes forms and rides at a pace between the A and B Groups. Sunday, Tuesday, Thursday and Saturday rides start at Mesilla Plaza unless otherwise noted. ride with most riders meeting for breakfast or coffee after the ride. or Dona 647-0757, (651) 398-6778. A faster (18+ mph) ride leaves from Milagro's around 7:30. Email Terri for more information. Note: The April 7th ride starts at 8:30 am at La Feria in Anthony. Tuesday April 2nd Let's start off the month with a ride to Picacho Hills and Airport, Bowlins for some. Brunch at the Bean. 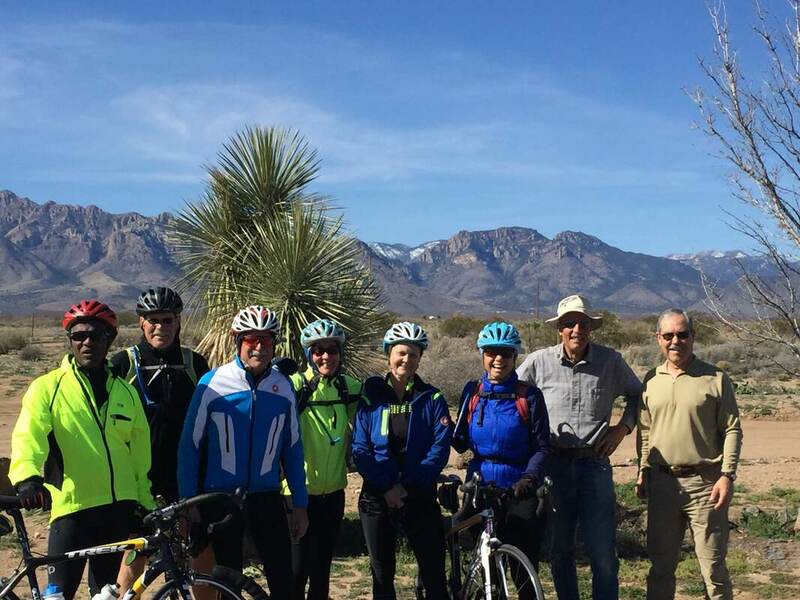 Sunday April 7th A perfect day to ride to Santa Teresa and El Paso. 8:30 start at La Feria in Anthony. Scenic valley ride to Santa Teresa airport and then down to El Paso for breakfast at Ramon's. Total miles: 36. Don’t forget to cheer on those who signed up for the Tour de Optimism ride. Tuesday April 9th Ft. Selden, add the hill for those who want more. Brunch at the Bean. Sunday April 14th East Mesa Loop, to Chucky's, back via Camino Real. Breakfast at Starbucks, Nueva Casita, Bite of Belgium? Tuesday April 16th Lets try Afton again and hope the winds are in our favor. The 4-way or Tower for some, brunch at the Bean. Sunday April 21st Easter Sunday North to Hill, then to Chucky's, return via Camino Real picking up the bike path heading towards Triviz. Brunch at Milagro, call ahead to see if they are open. Tuesday April 23rd Lets put a couple together, south on 28 to 4-way, east to Vado, lets ride to Lords Ranch, head back north on the frontage road to add Telbrook hills. Milagros for brunch. Sunday, April 28th East to Organ via Triviz and frontage road, some may take the St. Augustine Pass challenge. Breakfast is rider’s choice. Tuesday, April 30th Visitors Center, Baylor Canyon before or after depending on the winds. Brunch at Starbucks or Milagros.